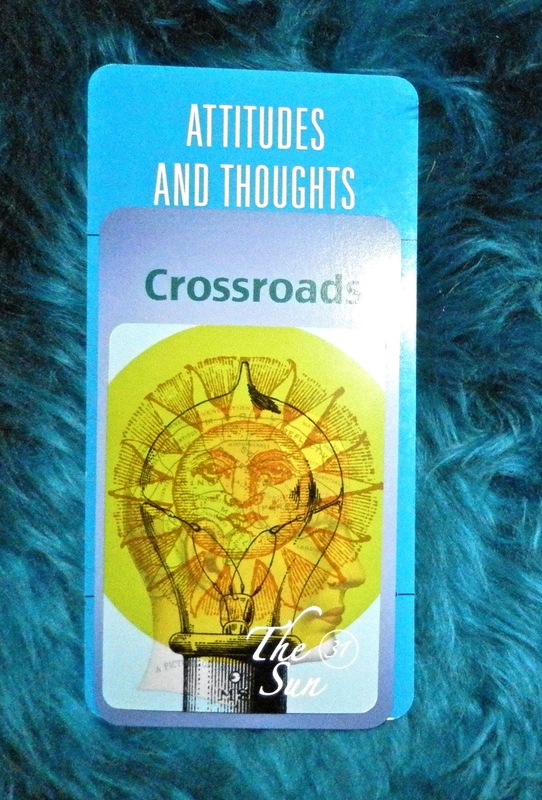 Today's Draw: The Sun in the House of Crossroads in the position of Attitudes and Thoughts from Shaheen Miro's Tattered Nomad Oracle, The Deck of Lenormand Houses and the Deck of 1000 Spreads. What does happiness mean to you? Are you more often happy than not? What wisdom do you have to share about happiness? My initial instinct on this trio was "Something That Will Change Your Attitudes and Thoughts About Happiness." My second instinct was, "No! Three Things...NO, Five Things to Change Your Attitudes and Thoughts About Happiness." Then my third instinct was, "hmmm, the Sun is more frequently about success. Five Things to Change Your Attitudes and Thoughts About SUCCESS!" Then I decided to go with the happiness thing. OK. None of these things may change your idea of what happiness is. But then again, I do this in about an hour and have to go with what comes to me. 2. Happiness is Not a Destination. It's part of the journey. There's never going to come a day when you're happy. Period. We all have ups and downs. We may be happy in one area of our lives and less than happy in another. It's not a place to land and plant roots. Nor do you want it to be. Because happiness should never become mundane. If it's how you felt all the time, it wouldn't be such a gift. 5. Happiness Shouldn't Necessarily Be Your Goal. Contentment should. See, the ultimate goal in life is supposed to be balance, right? Well, happiness is weighted to one side of the spectrum. It's not in the center. And the things beyond center are harder to maintain. Not only that, but in order to have balance, things that are weighted to one end eventually have to be mirrored by things weighted at the other end. But contentment is at the center. It's satisfaction. It's upturned lips and a relaxed brow, but not quite a full on smile. There may be things in your life that are less than hunky dory with contentment, but you'll take it. Because it's pretty good overall...pretty good for a Friday. It's the wellbeing without the exclamation point. And it feels really nice. And, with the right mindset, you can maintain it longer. So that's my list. What realizations about happiness have you made?